We promised a new and different Westcoaster, and we're pleased to announce our new topic of devotion to go along with the relaunch of the site. It's the exciting and captivating world of rabbits! 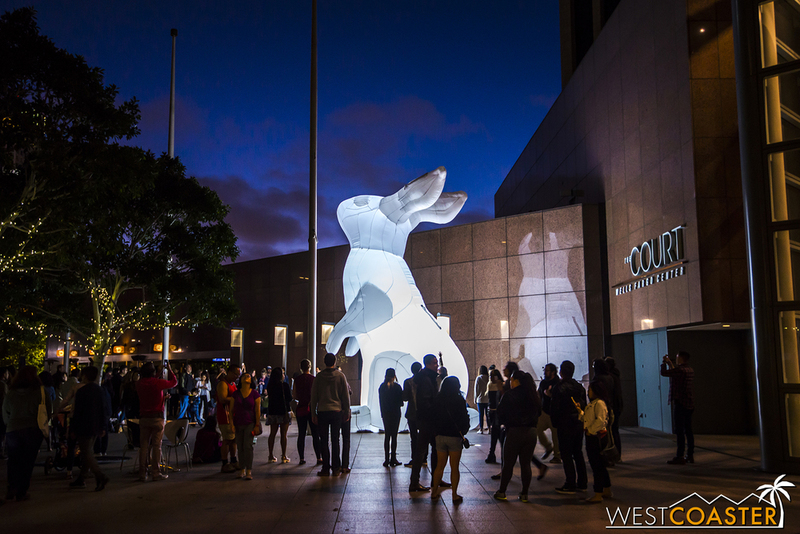 Yes, Westcoaster is now a rabbit-friendly site. We welcome rabbits of all colors and orientations to come to a safe zone of respite, where they can engage with other rabbits of similar interests and personalities. 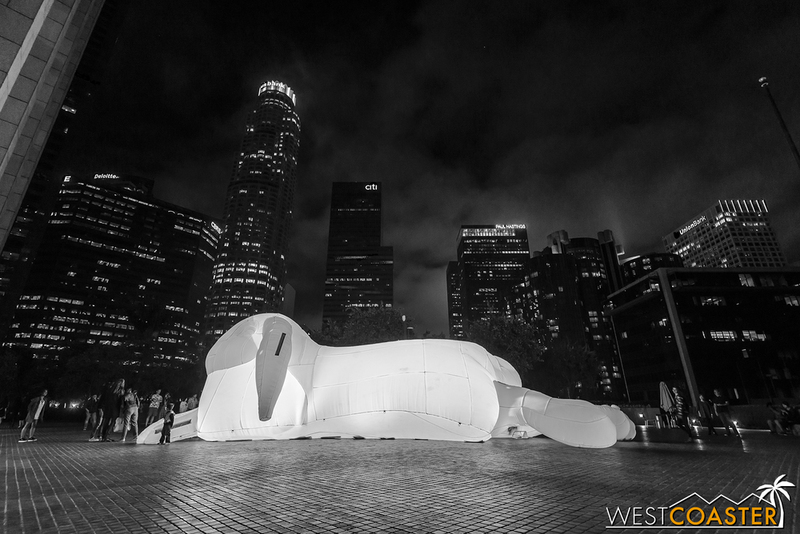 Oh, and also, last week, there was a free outdoor art installation in Downtown Los Angeles called "Intrude," by Australian artist Amanda Parker. You've probably seen these guys on your local Pinterest or Instagram. Intrigued, I headed over to check out the fuss. 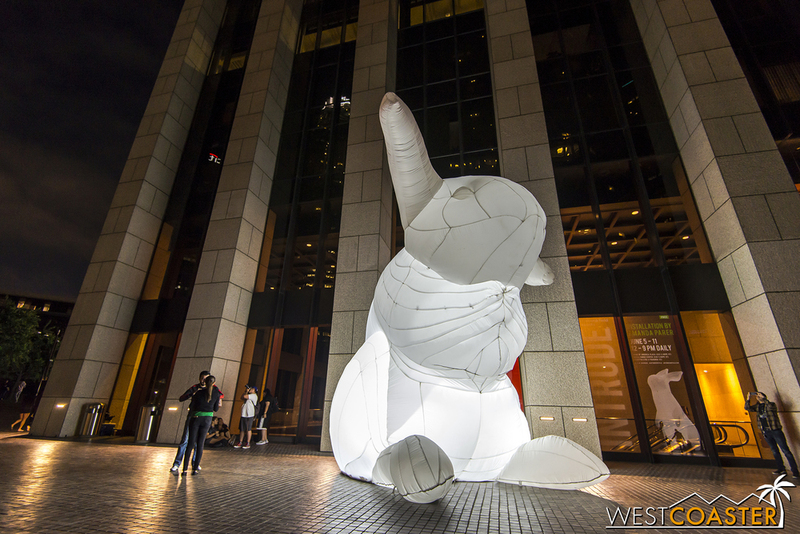 What I found was a lot of inflatable bunnies. No, not that kind, you gutter-minded ninny. The literal kind. 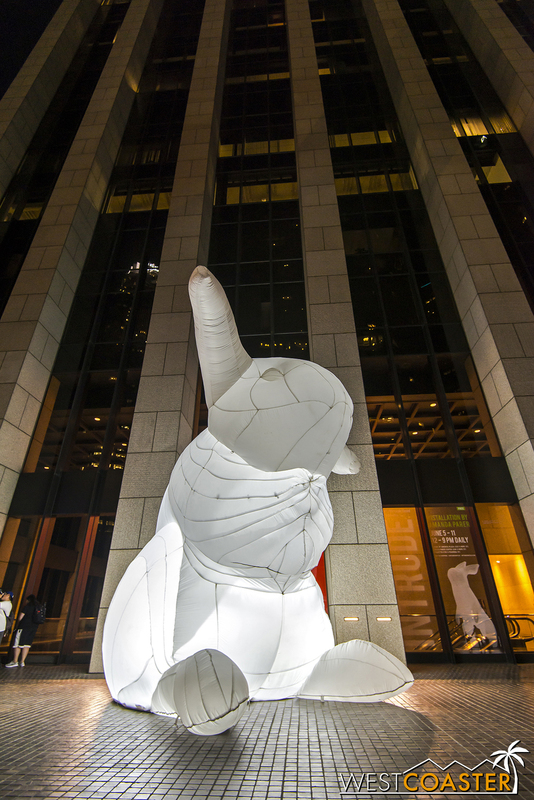 Spread across three sites in Downtown Los Angeles, near Figueroa and 7th Street as well as Hope and 4th Streets, these large, illuminated-at-night figures have been featured in installations around the world. They were in Downtown Los Angeles for only one week, but they proved to be quite popular. 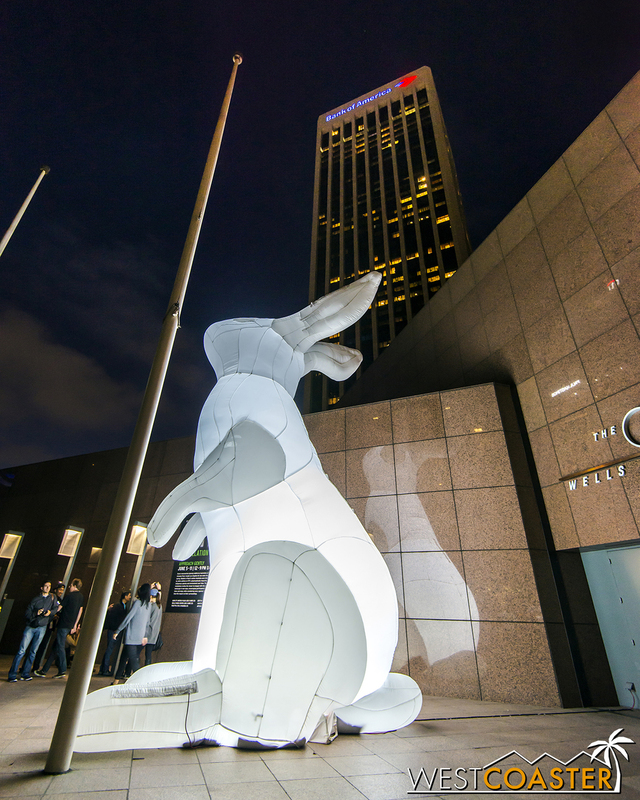 Here are some pictures of the nice display of free public art (from two of the three sites). We start first at the Wells Fargo Plaza, the second of three sites I visited. The first was Fig and 7th, but it was still daytime when that occurred, and nothing was really photogenic. Tall bunny is tall here. The setting blue hour made for quite a photogenic scene. And it attracted quite a crowd too. 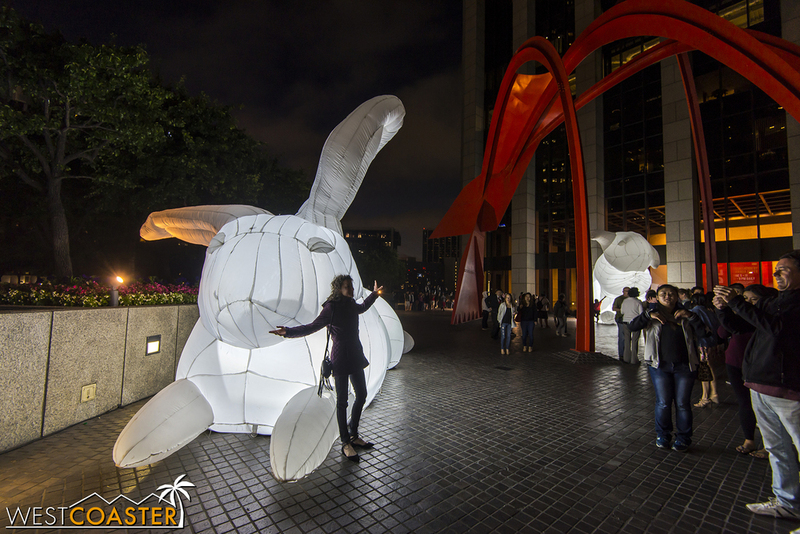 There were three bright blow-up bunnies here. This one was rather chubby. Probably been downing those bunny burritos too much. The plaza, with the red "Four Arches" sculpture by Alexander Calder, provided a very nice backdrop. With the Downtown L.A. buildings behind, the scene was quite nice! The third rabbit in this area was around the corner. This was the lazy one. All lounging around. And still, people wanted to take photos with it. But all in all, it was a fun and interesting exhibit! Too bad it was only a week, but it's nice to see free public art like this!